Some behind the scenes prep...separating seven hundred and some Otter Pops for all the classes. My fingers were so cold! It was 80's themed! Which is just so much fun! I'm pretty sure I should be a little bit ashamed of that fact that the only thing I had to buy was the fingerless gloves. Everything else we just had in our house. Oh and Preston's shirt. But I mean he can totally wear that again. Look at all those kids ready to run! The kids ran in four groups. Me and Liv joined Preston's group! We race around and each group has a class with the most laps and they win the Golden Shoe! It's a big deal! I was part of the committee for the fundraiser, so me and Liv were hanging around all day. 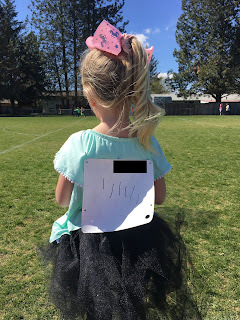 She decided to run with the kindergarten classes too! All on her own, my big brave girl! She did six laps! That's 1.5 miles! I was impressed. Especially when she ran earlier with Preston's group! And then she was exhausted. And made some new friends who were also exhausted to come play with her. We finished the day exhausted. Like forgot I drove and parked and walked home exhausted. But our school not only hit our goal but blew it out of the water! Worth it! Today is CRAZY. Straight up busy. We started the morning at a birthday party for our neighbor. Headed to Bethany's for her annual Easter Party. Late. But she loves me anyways. And from here we're headed home before the flashlight egg hunt in our neighborhood. Crazy town. Made even better with tomorrow being Easter and then we have one down day before we pack our bags and fly out for Spring Break in Oceanside. Life's better when it's crazy town right? But before I get further ahead of myself. Complete with the kids favorite part. The egg hunt! Away they go. The hunt was on for the golden egg. It's a crack up to watch. The little kids just want all the eggs. The big kids want the eggs too but they are really looking for the golden egg. Because that egg has the money in it. It was a hard search this year. I even started looking and would have found it but no way was I sticking my hand under dark spaces. There could be bugs guys. BUGS! Thanks for the invite Bethany! We had a blast! Olivia's preschool class headed to a local private school for a field trip. We were invited to come and experience the story of Easter. It was incredible. The students and teachers did such an incredible job. We moved from room to room and each room told a different piece of the story. It was such an amazing experience for the kids. And the adults. But first. The bus ride. Olivia was pretty excited! She started out sitting with friends but then decided to come sit with me. We arrived a little early so the kids got to play on the playground. It was cold! But they didn't seem to mind all that much. Me and Olivia also got to hunt down a bathroom. Because someone always has to pee! We headed in. The kids also got to bring an empty egg carton and in each room as they told part of the story they gave you something to remember it by. We ended with songs before hopping back on the bus to head back to preschool. The kids loved it! These two. I just LOVE their friendship. They are both such sweet kids. And it just breaks my heart that they will go to different elementary schools next year. Sob! They rode next to each other on the bus ride back and were full of giggles. They were pretending that their egg cartons were iPads and they were playing games on them and showing each other. and trading back and forth. And how stinkin' cute are Olivia's Valentine's Day cards! I die! And look how good she wrote her name! Olivia's class had a party! Preschool Valentine's Day is so much fun! Then we ran and grabbed cupcakes and headed to school to meet Preston and Madison for lunch and surprise them with a treat! Now for take out and a movie and a night in!